I decided that the first post of the blog obviously had to be on the Elvery’s cricket bat, with its bullet lodged in the front section. It was donated to the museum’s Easter Week Collection in 1981, and quickly became a firm favourite among the staff, who came to affectionately call it The Cricket Bat that Died for Ireland. The object itself is pretty descriptive of much of the NMI’s collection relating to the Independence period – lots of souvenirs and relics picked up and kept by the people who witnessed events or their aftermath, and eventually finding a home in the museum. The bat had the misfortune of being on display in the shop front of Elvery’s store on O’Connell Street, then Sackville Street, during the Easter Rising. J.W. Elvery & Co. was Ireland’s oldest sports store, specialising in sporting goods and waterproofed wear, with branches in Dublin, Cork (Patrick Street) and London (Conduit Street). 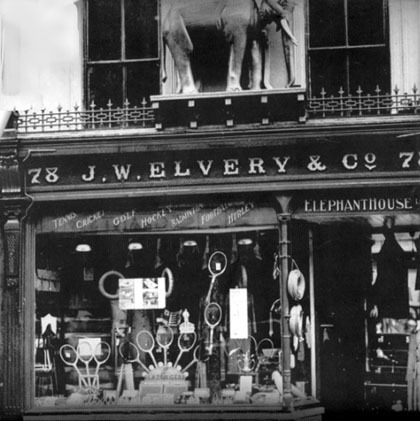 The shops had a distinctive figure of an elephant above the front door, giving them the name Elvery’s Elephant House. 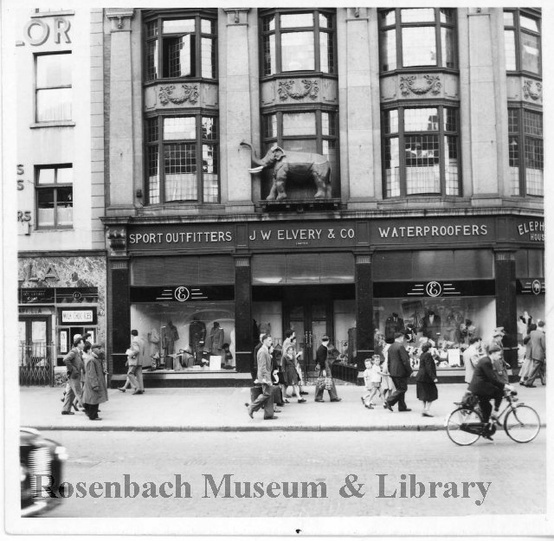 Its city centre branch was at this time located at 46 & 47 Lower Sackville Street (now a Supermac’s, sadly without the elephant though its plinth is still there), and even got a mention in James Joyce’s Ulysses. Its location, about one block from the GPO, meant it was in the middle of the cross-fire and general destruction of the main street. While it’s neighbour the Metropole Hotel was razed to the ground, it escaped the worst, though it was badly damaged. There were also reports of widespread looting on the street from the night of Monday the 24th. The Sinn Féin 1916 Rebellion Handbook, published by the Irish Times in 1917, describes children roaming the streets with sweets, toys and ‘hockey and golf sticks and all kinds of articles used in popular pastimes’, which would certainly suggest Elvery’s was a victim. 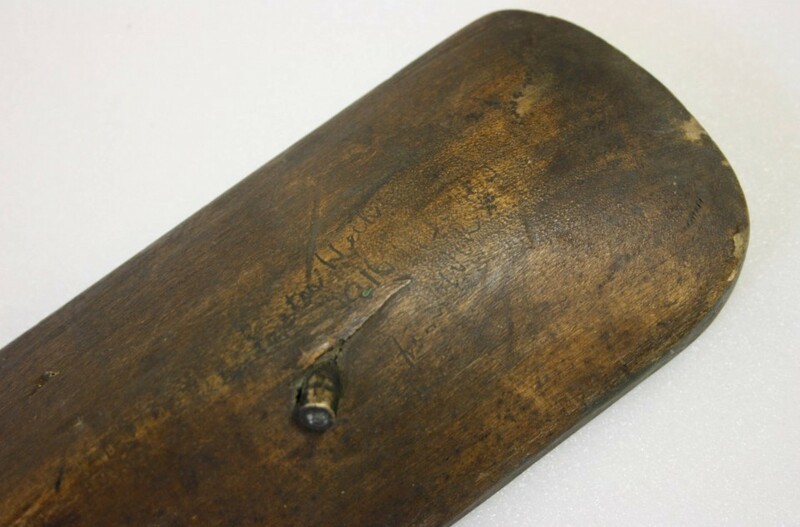 The bullet lodged in the wood of the bat is a .303 calibre, which was used by the British Army for both their standard issue Short Magazine Lee Enfield rifles and also Lewis machine guns. The Irish Volunteers had about 900 1871 model Mausers, landed at Howth two years before, which used .45 calibre ammunition, so the bat was shot by a British gun. Rifle fire on Sackville Street was heaviest on the Tuesday of the Rising, before the fires began to spread on the Wednesday, so it’s possible, though not certain, that the bat was shot on that day. Perhaps one of the reasons the cricket bat has captured so many people’s imaginations is the idea of such a symbol of ‘Britishness’ taking a bullet in the rebellion. Maybe the fact that the bullet came from a British weapon adds to the irony. But surprisingly (well, it was surprising to me, not knowing much about sport), cricket had been a popular pastime in Ireland with both the gentry and tenant classes for over a century. It is thought that the game was introduced in the early 19th century by the British garrisons and the landed classes who were educated in England, with teams formed on estates comprising both the Protestant and Catholic population, with the Catholics often being paid to make up team numbers. The first real account of a cricket game here was in 1792, when the Military of Ireland played the Gentlemen of Ireland in the Phoenix Park. It also became a widely played sport in rural Ireland; John Parnell, father of Charles Stewart Parnell, even founded a club in Avondale, Co. Wicklow in the 1830s. It began to go into decline during the period of the Land Wars from the 1880s, when it came to be more associated with England and the landed aristocracy. The GAA’s 1902 ban on ‘foreign sports’ further fueled its decline (for a history of cricket in Ireland have a read of Gerard Siggins’ Green Days : cricket In Ireland 1792-2005, and Michael O’Dwyer’s History of Cricket in Count Kilkenny – details in the Further Reading section). Still, the game survived, and clearly remained popular enough for Elvery’s to advertise cricket bats in their shop front display in 1916. This entry was posted in 1916 Rising and tagged 1916 Rising, cricket, Dublin, Easter Week, O'Connell Street. Bookmark the permalink. Pingback: Elverys Sports Blog | Your Sport. Our Passion. was the cricket bat ever stolen ? No, it was found in the shop and stayed with the shop’s owners until it was given to the museum in the 1980s.